Jeff Cable's Blog: Photographer's web site do's and don'ts: My advice for looking your best! Photographer's web site do's and don'ts: My advice for looking your best! Lets face it folks, this Internet thing is here to stay. And dare it to say I think that someday people will shop online, get their news, and do their banking from home. What - that has already happened? Of course it has. The web is a powerful thing and it is imperative for us photographers. It is a place where we can show off our work and attract new clients. I am writing this blog post to help all you photographers get the most out of your web sites. Why is our web site so important? We are photographers and our job is to create stunning images. Not only is it fun to share those images with the world, but posting these photos on our web site is also a way for us to gain new clients. 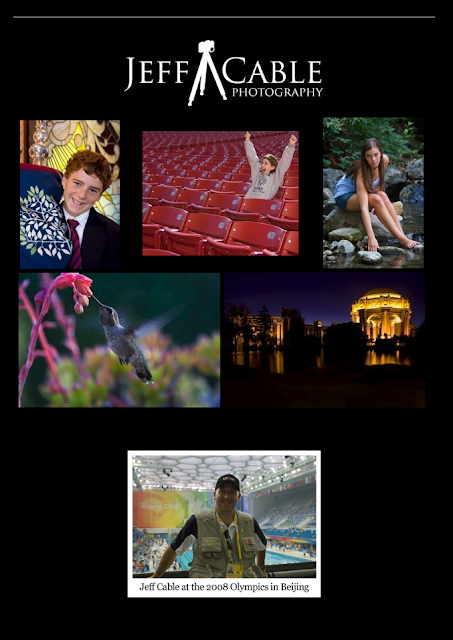 My goal with my own web site is to highlight my favorite current photos and show the breadth of what I photograph. I want prospective clients to see my best work and think "I want this guy to be my photographer." Remember the old days when you would drive by a nice big building with a company name on it and think "wow, they must be successful"? Well...today your web site is that building and you need to impress people with it! The first place that people will land will likely be your home page. Make darned sure that your home page has your best work and that you are showing it off the best you can. Some photographers like to show off their images as large as possible, with the image getting larger as the browser is enlarged. I personally don't want that. I want my home page images to stand out, but I don't want them so big that people can screen grab them and steal them. But I do want the photos to be large enough to wow the visitor. Oh, and be wary of the order of the photos on your home page. If you only shoot weddings, make sure you have your best wedding photos as the first images that come up on your home page. 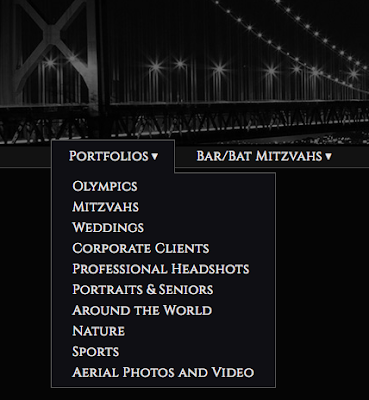 If you shoot weddings and senior portraits, have great images of both on your home page. And make sure that those images highlight your shooting style. Remember, most people are not going to stay on your home page for very long, so you want to wow them with the first 2 or 3 images, because they may not last much longer than 10 seconds. I am a strange photographer and shoot a little bit of everything. I have had many people say that I should have a different web site for sports, weddings, bar mitzvahs, senior portraits... but I like showing that I can shoot a lot of different genres. It may not be for everyone, but I like it. But, with that said, I have put thought into my home page images. I lead with one of my favorite Olympic photos (to show that I have photographed high profile events like the Olympics) and then I have a mitzvah image, a senior portrait and a wedding photo following soon afterwards. It is all calculated. It is imperative that you organize your web site so that your viewers can find what they want, and find it easily. I have separate portfolios for each type of photography I specialize in, and even have a separate additional menu item for Bar and Bat Mitzvahs. The reason for the separate call out, is that a large majority of my photography income comes from these events and I want to highlight that to prospective clients. I see many photographers who have web sites that look like they were created back when Netscape was the popular browser. The sites look stale with tiny little images and 10 different fonts on one page. This is not going to help these people get new clients. Even those people who have nice web sites need to make sure to update those sites with current photos. Hopefully you are improving each time you shoot, and you want to show off your latest and best photos. I know some really good photographers who are currently representing themselves poorly because none of their newer better photos are on their web site. This is a shame. This is probably the one mistake that I see the most with new photographers. They think that they need to have 40-50 photos in each of their portfolios. If you are new to the photography business and only have 5 great wedding images, then only have those 5 on your site. Remember, us photographers are judged not by our best photos, but by the weakest. If you have 5 great images in your wedding gallery and then a bunch of sub-par photos, you will lose the interest of your prospective client. As you build out your website, try and keep everything as consistent as possible. Try and use only one font throughout the site if you can. There is nothing more distracting than reading a web page that has 10 different fonts scattered throughout the page. I also try and keep the images the same size so that things look cleaner. You can see this on my workshop page, where all images are 500 pixels wide. 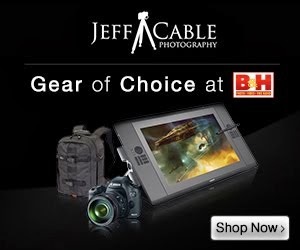 I created the first Jeff Cable Photography website with Apple's iWeb application. It was easy to create a decent looking site, even if it was very limited. I was OK with that site (screen shot from 2006 above) until Apple announced that they were no longer going to develop the application and that it would not run on future operating systems. Then I was in a panic to find a better solution that would give me the look I wanted, the power to do more than just show photos, but also be simple enough for me to administer it myself. After a ton of investigation, I decided to go with Zenfolio, and I have been loving it ever since. About 5 years ago I even became one of their Ambassadors. The interface is not perfect, but it allows me to administer my own site easily. This is really important because I am a control freak and don't want to hire someone else to do my day-to-day maintenance of the site. If I just took a cool new shot, I want to put it on the home page immediately, bot wait for someone else to get to it. When I used iWeb to design my site, I was forced to do all my website updates on one computer. Since I did everything on my desktop Mac, I was not able to update the site remotely. For some people this may not be a big deal, but for me, I really wanted to update the latest Olympic gallery while I was in that city actually photographing the Olympic Games. I remember sitting in the airport in Russia, heading to Sochi, and updating my site from my Macbook Pro. It was so liberating! In the old days, when I was still designing my web site using iWeb, I had to use a separate hosting company for all my client galleries. It was a cumbersome and a not-so-reliable solution. Now I am using Zenfolio for my client galleries as well, and I love that those galleries are integrated into my overall site. So now everything has the same look and feel, and I can easily sell photos from my site. (For those photographers who say that prints are dead, I would disagree. I have received two print orders while writing this blog post.) 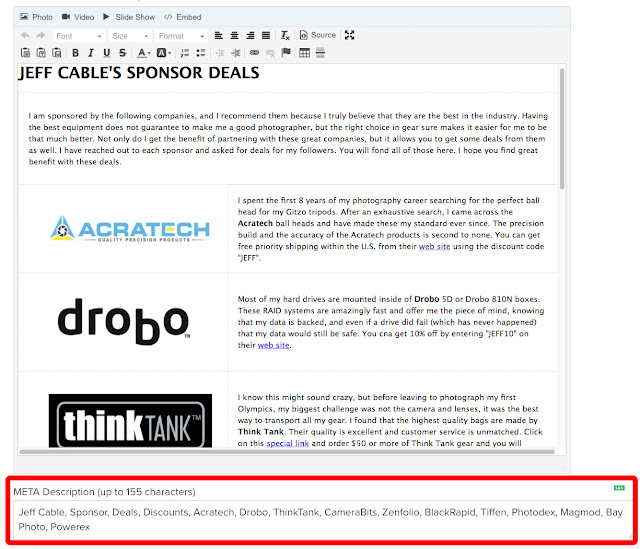 I also made sure to purchase my own domain and link it to Zenfolio so that my visitors see "jeffcable.com" and not "zenfolio/jeffcable". As much as I love Zenfolio, I want people to see my brand, not theirs. Having my own domain also means that I have an email address at jeffcable.com and not gmail or Yahoo. I know that this is not a huge deal to people, but I feel that a true professional has an email address at their own domain. And do I scoff a bit at that person still using an AOL email address? Yep. It is important to link all of your online properties together. With that in mind, make sure you have links to your social media sites on your web page. And have links on your social sites that point back to your website. 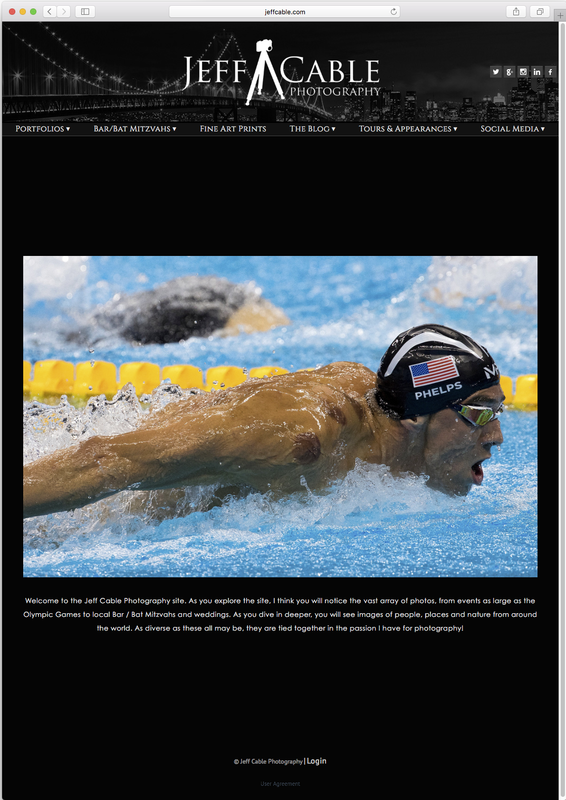 Most photographers have an "About" page on their website that tells a little bit about them. You can choose to write this in first person or third person. Either way is acceptable. For this page, it is best to try and tell your story and help people understand who you are and what makes you different from everyone else. I find this to be one of the more difficult pages to create and maintain, because you have to try and write all about yourself. There was a day when it was recommended that your web site be "mobile friendly", but those days are over. Today your website HAS to be able to be viewed on mobile devices and should not use flash. Google even announced that as of this year they would not show sites that were not mobile optimized. This would be a problem for me since I am not a web developer, except that Zenfolio handles all of this for me. Zenfolio has tons of different templates, and all are mobile optimized. Sometimes I will play with these to see what my site would look like in those templates (without publishing it for real). SEO stands for Search Engine Optimization, and this is very important for helping to drive people naturally to your page. Make sure that you add keywords to your web pages so that the Internet search engines (like Google, Yahoo, Bing and others) can find you. You will notice that every page on Zenfolio has an SEO box where I can put SEO keywords. As I mentioned earlier, I am breaking some of the unwritten rules with my own website. For one, I do not show one specialty, and have portfolios for many different genres of photography. Even though I have contemplated a change in this regard, I have decided that I have a wide viewership and want to leave them all on my site. * Gear page - highlighting the gear I use, since so many of you ask about that. Time for you to create or improve your website! If you are interested in trying Zenfolio for yourself, you can save up to 28% off the regular annual pricing by clicking HERE. I know that this is a lot to take in, and heck, if you made it this far, I am proud of you. I have spent many years building and refining my website and I hope that all my success and failures has given you the insight to improve your own site. Thank you so much for this blog post! I am a photography hobbyist and after many months of procrastinating, I started building out my website. This blog post has given me that extra motivation to complete my website and move on to the other photography "To Dos" on my list.